Mod The Sims - Full Range Shiftable OMSPs - Closer than we've ever been! Hello again. This set was a request by snowmoon2001 who wished for shiftable OMSPs with more height increments than my previous ones, and who was nice enough to test these for me and give feedback. I appreciate it very much. Thank you. What's new about these OMSPs? The original Standard Shiftable OMSPs only had 3 heights. This set has 10 heights, a mere hair's width apart, which will allow you to match heights with anything in the game with enough accuracy to satisfy even the pickiest of players. As you can see, the first block starts at ground level and the rest get progressively higher by the tiniest of increments until they reach the height of the first block shifted up once. And the chain goes onward and upward, covering the entire height range from floor to ceiling--300 different placement options! As usual, these will hold almost any one tile object, giving you much more freedom to decide what goes where. This type comes in two sizes, large and small. The small size is the same as the small size of the old Standard Shiftable Shelves, and should work for many objects. The large size is almost a full game-tile square and will hold large objects that would be too wide for the small block. These shelves are purple and numbered. There is also a set based on an end table which will hold restricted placement items like small electronics and table lamps which cannot be held by the other blocks. These only come in the small size, because none of those end table items need the larger size. These shelves are green and numbered. But how do I know which block to use? Now, ten OMSPs is fewer than the total number of OMSPs a lot of us have had in our games over the years. But these 10 OMSPs have multiple uses, depending on what height you click them up to, and you might get in game and realize that you have no idea where to start with them. To help with this I have compiled a list of what blocks line up with which objects in game, and how many up-clicks they takes to get there. 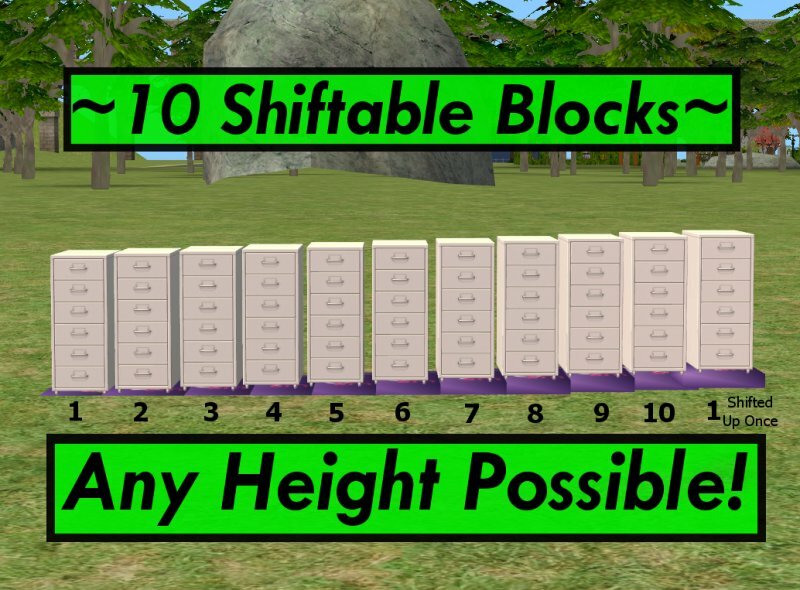 For example, Block 1 clicked up 10 times is exactly counter height. I covered most everything one would normally put deco objects on, as well as a few I thought would be useful in posing Sims, like the edge of the above ground hot tub. I did not do every single living chair, recliner, lounge and couch because their heights are just so varied depending on the poofiness of the cushions, so these heights are just an average. This list is arranged according to the BuyMode Catalog. It is in Text document form and is included in each download file. You can print it out for easy reference. This means Block 1 clicked up 10 times will get you the height of the counters in game. Start with Blocks 1 and 6. Click both up until you see both over the surface of your object, keeping in mind how many clicks each took to get there. If one of them matches exactly, you win a gold star! If not, keep reading. Did they take the same number of clicks? If so, the block you want is between 7 & 10, with one less click. If Block 6 took less clicks to get there, the block you want is between 2 & 5, with the same number of clicks as Block 6. The height pattern is circular: if Block 1 is too high, go down to Block 10 with one less click up (and then 9, 8, etc.). If Block 10 is too low, use Block 1 with one more click up (and then 2, 3, etc.). Blocks 1 & 6 are midpoints of this pattern, and so make excellent gauges to see what blocks are best to try without going through all 10. It is easy to eyeball it too, though, so don't worry if all this confuses you. There seems to be a limit to how low a object can shift in the game. If you start below that limit you can shift up/down like normal until you try to go back outside the limit--and then the game resets the object to the lowest allowed shift height. Once this happens the only thing you can do is get a new block. If you place the block and click it down immediately the height resets. I've done this accidentally many times. If you grab the block and hit 'Esc' the height will reset. Block 1 of all the shelves sits at ground level, flush with the floor. This makes the texture scratchy because it mingles with the floor, and it can also make the block tricky to grab sometimes, but I haven't found it terribly inconvenient, as it is rarely ever used right on the floor. Once clicked up this problem goes away. All blocks do allow for Sim and object intersection. 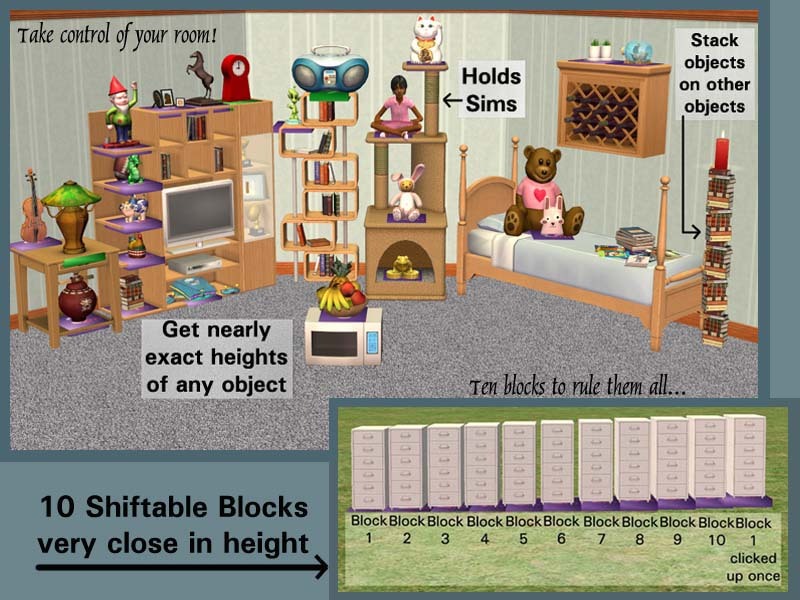 The purple blocks will hold Sims without causing game crashes, and the tiny increments possible with these should be a great help for posing Sims, especially with poses that make the Sim to sink down a bit, causing them to be eaten by whatever furniture they are on. These blocks will also hold the BaseGame Angled Shelves for a fuller height range of tipped over objects. While the purple blocks will hold almost any 1-tile object, there are limitations. They will not hold tables, some 1-tile coffee tables and the wall hanging TV. You will certainly run into other objects that can't be held. They also won't hold table lamps or small electronics--that's what the end table set is for. These can be found in the catalog under surfaces>miscellaneous for $0. Or, if you don't want them clogging your catalog, there is also a set that will only show in the Collections folder. You need the Collection File for these to work! A Collection File is included in each download. It goes in My Documents > EA Games > The Sims 2 > Collections. The icon is purple with black lettering saying "OMSP". There are two files available. They are exactly the same, same GUIDs and everything. The only difference is that one set will show in the Buy Mode Catalog and one set will ONLY show in the Collection Folder. Full-Range-OMSPs_in_catalog.rar These will show in the Buy Mode Catalog. Full-Range-OMSPs_NOT_in_catalog.rar These will NOT show in the Buy Mode Catalog--only in the Collection folder. Do Not download them both unless you want to mix and match which blocks will show in the catalog and which won't. Since these rely on the shift feature that came with Apartment Life, they require that expansion to work. Purple blocks were cloned from the tiny deco shelf from AL. Green blocks were cloned from the Moroccan end table. Thanks much to snowmoon2001 for testing these blocks out and giving insight on how to make them better. Many thanks to Numenor and fisheeyes for their tips and tutorials on slots. Thanks to Numenor for the AnyGameStarter, which I used to test these. It's awesome--go check it out! Many, many, many thanks to Bobcatben for making the SMD importer/exporter for Blender. And thank you to MTS for hosting my uploads, and for all the great tutorials and help found here, and to the SimPE team.